The volume contains nine articles arranged in roughly chronological order, beginning with the latter phase of the Hundred Years’ War and ending with the Wars of the Roses, the Burgundian wars, and the Flemish-Brabantine Revolt of the 1480s. The first, Guilhem Pépin’s “The French Offenses of 1404–07 against Anglo-Gascon Aquitaine,” examines a campaign that, while considered critical at the time, has been neglected by scholars in favor of the contemporary (and more historically significant) conflict around Calais. Though slightly dry in tone, Pépin’s is a very well documented and competent overview of this campaign, which displays many of the hallmarks of late medieval warfare. Two of the papers in the volume deal specifically with Wales and historical memory. The second essay, Adam Chapman’s “The King’s Welshman: Welsh Involvement in the Expeditionary Army of 1415,” challenges popular wisdom about Welsh involvement in the campaign that culminated in Agincourt; the fifth, Barry Lewis’ “The Battle of Edgecote or Banbury (1469) Through the Eyes of Contemporary Welsh Poets,” engages with underused sources to explore this little-understood battle, which is otherwise obscure for reasons of reliable sources and the resulting lack of scholarly attention. Again displaying the excellent research characteristic of this volume, Chapman challenges the prevailing narrative of Welsh footmen as key players in this conflict. He examines recruitment records and argues that the Welsh were not an overwhelmingly significant part of the expeditionary force, and that those who enlisted came opportunistically from diverse regions, including the royal demesne. Furthermore, the force included former rebels and thus offered a means of reconciling the Welsh to royal authority. In this sense, it seems to me that it succeeded: Thanks to Shakespeare, the legend of the Welsh longbowman at Agincourt became, however inaccurately, part of the English national narrative. For his part, Lewis uses Welsh-language sources to reexamine Edgecote/Banbury; however, he makes a compelling case for the cultural centrality of Welsh-language poetry and for its usefulness as a historical source. Likewise, Lewis points out that the significance of this battle for the Welsh political landscape, if not for England as a whole, was the defeat of the largely Welsh royalist army by a northern coalition. This loss resulted in the downfall of the powerful Herbert family, which, despite its name, was Welsh through and through. Elegies for the Herbert family form the core of Lewis’ sources, and he uses them to help fix the date of the battle and to describe Welsh attitudes towards the fighting and their fallen hero William Herbert. 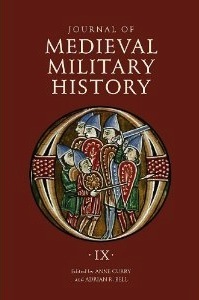 Andy King’s short but excellent “Gunners, Aides and Archers: The Personnel of the English Ordinance Companies in Normandy in the Fifteenth Century,” the third in the volume, examines a critical aspect in the historiography of fifteenth-century warfare: The establishment of an artillery corps. King masterfully uses diverse sources to examine personnel, finances, and recruitment. This mini-prosopography reveals some surprising facts, including high turnover and diverse origins of artillery companies—especially from archers and even foreigners. This, in turn, gives us an intriguing insight into the emergence of early gunpowder armies. The various armed guilds of the Low Countries, such as the shooters’ and fencers’ guilds, not only served a military function, but were a vital part of the social fabric. Laura Crombie considers the shooting guilds’ political aspects in her “Defense, Honor and Community: The Military and Social Bonds of the Dukes of Burgundy and the Flemish Shooting Guilds.” Crombie reveals that, interestingly, the dukes themselves took part in guild competitions as part of an overall propaganda and public relations strategy; they also issued charters of privileges in a policy that paralleled the formation of fencing guilds in the Holy Roman Empire. While this served the dukes’ needs for trained troops, it no doubt (as I shall venture to point out) also served the guilds’ needs for both legitimization of their social role and pretentions to status in a world where carrying weapons in service to a lord was the mark of gentility. Andreas Remy begins the sixth essay, “Descriptions of Battles in Fifteenth-Century Urban Chronicles: A Comparison of the Siege of London in May 1471 and the Battle of Grandson, 2 March 1476” with the truism that medieval chroniclers were often biased. Regarding the first conflict, he points out that the “townie” perspective on this fairly well-documented but not strategically decisive battle tended to play up Londoners’ military abilities, the forethought and planning of the town fathers, and the justice of their cause. Regarding the second, he observes that the Swiss, when defending their homeland from Burgundian incursion in 1476, demonstrate civic pride through a focus on individuals from the chroniclers’ home commune. At the same time, however, they also mention a particularly Swiss religious devotion, depict the Burgundians as unfaithful Christians, and discuss the plunder that was absent at London. In both cases, the historical memory of the battle became assertion of civic independence, strength, and community. Bastian Walter’s “Urban Espionage and Counterespionage during the Burgundian Wars (1468–1477)” handles another side of the conflict between the Swiss communes and Burgundian forces. Reconstructing spy networks—or, more properly, methods of military intelligence—is difficult, but Walter dips deep into Strasbourg town records to reconstruct this fascinating but little-studied (at least in English) aspect of medieval warfare. Merchants could bear news, the Swiss communes were highly attuned to the military implications of the marketplace, and clergy and tavern-keepers likewise played roles. Finally, there were the professional spies, some of whose escapades made them seem like medieval James Bonds, and who apparently developed both a class and a community identity. While this last assertion has the vague air of graduate-school totemism to it—and, indeed, Walter’s notes indicate that the article is derived from his dissertation—I, for one, look forward to the eventual publication of his thesis. Frederik Buylaert, Jan Van Camp, and Bert Verwerft’s article on “Urban Militias, Nobles and Mercenaries: The Organization of the Antwerp Army in the Flemish-Brabantine Revolt of the 1480s” handles the organization of an army on the cusp between medieval and early modern warfare, and is a useful counterpoint to King’s and Chapman’s articles at the beginning of the volume. No significant aspect of the army Antwerp assembled to put down the Flemish-Brabantine rebellion against the Holy Roman Emperor escapes the authors’ attention. While the ultimate command and also leadership of the cavalry rested with the upper classes, many with Hapsburg connections, the recruitment of the rather large and expensive force was both commissioned and well documented by the town council. The infantry commanders, on the other hand, were mercenaries, while the logistics staff were often members of the urban elite. This is a very good case study that, besides illuminating the political aspect of this war and the unique aspects of Antwerp’s military organization, also helps to illustrate the military revolution as a whole in its economic and social contexts. Finally, Randall Moffett examines “Military Equipment in the Town of Southampton during the Fourteenth and Fifteenth Centuries” in the ninth and final essay. Using a variety of sources, ranging from archaeological finds to wills, he finds evidence of artillery, crossbows, armor, and hand weapons in the fourteenth-century, and lovingly details fortifications with several accompanying photographs. (Of interest is perhaps a fragment of what Moffett asserts is a very early mid-fourteenth century single-piece breastplate.) The fifteenth century saw an updating of the fortifications and an increase in gunpowder artillery, with a probable concomitant increase in the private ownership of weapons and armor—though this latter item, Moffett admits, is difficult to fully document through surviving sources. The residents of Southampton, he nonetheless concludes, fulfilled their obligation to be ready for civic self-defense, were mostly self-sufficient in this regard (including in the manufacture of gunpowder), and had access to the latest in weapons and armor. Moffett’s observations concerning the business of arms being a quotidian, but often neglected, aspect of the urban landscape thus fit in very well with those of Remy and Crombie. This is a very well thought-out volume; the essays hang together well and are uniformly well researched and documented and do much to illustrate just how warfare—and the organization of warfare—changed over the course of the fifteenth century. One might, by way of critique, point to a definite Anglo-Franco/Low Countries bias in this volume; certainly, Spain, Italy, and the Holy Roman Empire experienced interesting military developments during this period that bear examination. Of course, this bias is only natural, as the papers came from a 2010 conference panel with the theme of “England’s Wars 1399—c. 1500.” Such quibbling is, however, besides the point: Curry, Bell, and their contributors continue the JMMH’s tradition of excellence and provide us with a very welcome contribution to the field. See on this Rogers, Clifford J. (ed.). The Military Revolution Debate: Readings On The Military Transformation Of Early Modern Europe. Boulder: Westview Press, 1995. This entry was posted in BookReview and tagged 15C, JMMH, soldiers. Bookmark the permalink.